This is an (ortho-) mosaic map of the Apollo 17 landing site (L15K 20.2/30.7East COMT). The map includes nomenclature, elevation contours, the astronauts' major geology stops, and rover traverses. It covers an area of about 14 km x 12 km of the Taurus-Littrow Valley, from 30.4294°E to 30.9162°E in longitude and from 19.9771°N to 20.3639°N in latitude. The image component of the map is an orthomosaic (0.5 m/pixel) that was created from images provided by the Lunar Reconnaissance Orbiter Camera (LROC) Narrow Angle Camera (NAC). Orthorectification of the images was based on a DEM (1.5 m/pixel) which was processed from LROC NAC stereo pairs. The DEM was also used to derive elevation contour lines, which were included in the map to indicate topography. The DEM and the orthomosaic are available as related products. We also determined the locations from where the Apollo 17 astronauts acquired station panoramas, and where they deployed ALSEP instruments. For this, we jointly analyzed the on-site Hasselblad photographs and the LROC NAC orthomosaic and registered the surface images to the orbital image. The determined camera and instrument positions were mapped in large scale station maps and are provided as ancillary cartographic products. More details on the localization approach and the station maps are provided by Haase et al. (2018). Please note that all files, including original PDF, PDS3 images, and all GIS files are available for download within the file "Apollo17_PDS_fullPackage_Haase.zip " listed under ancillary products (right side). The Apollo 17 landing site map was created for an improved cartographic representation of the exploration site of the astronauts. It provides an improved cartographic context to the on-site experiments and the crew’s geologic traverse. It also supports future landings and mission operation. Please note that all files, including original PDF, PDS3 images, and all GIS files are available for download within the file "Apollo17_PDS_fullPackage_Haase.zip " listed on ancillary (right side). The orthomosaic is controlled to the Mean Earth/Polar Axis-coordinates of the ALSEP central station given by Davies and Colvin (2000) and thus only as accurate as the coordinates derived from interferometry (~10 m). Vertically the elevation contours (DEM) were controlled to selected tracks of LRO’s Laser Altimeter (LOLA). The standard deviation of the elevation differences of the selected LOLA profiles and the corresponding elevations of the controlled NAC DEM was ± 1.3 m.
horizontal: Mean Earth/Polar Axis-coordinates of the ALSEP central station given by Davies and Colvin (2000); vertical: selected tracks of LRO’s Lunar Orbiter Laser Altimeter (LOLA). The map-sheet designation is L15K 20.2/30.7East COMT. "L" stands for Moon, "15K" specifies the map's scale of 1:15, 000, "20.2/30.7 East" designates the planetocentric latitude and longitude to the nearest decimal degree nearest to the center point of the map, and "COMT" is an acronym for "Controlled Orthophoto Mosaic with Topography and nomenclature". The projection is Transverse Mercator Projection. The figure for the Moon, used for the computation of the map projection, is a sphere with a radius of 1737.4 km. The map scale of 1:15000 is true on the line of tangency at 30.7°E (=central meridian). The datum (the 0 m contour) for elevations is defined as the radius of 1737.4 km. The names of geologic features which are approved by the IAU are marked in regular font. Additionally, names of features that were suggested by the Apollo team and are commonly used are provided in italic font. See the Gazetteer of Planetary Nomenclature for a complete list of IAU approved names on the Moon. We mapped the nine major geology stops of the crew (traverse stations) according to the geolocations that we determined as parking positions of the rover. 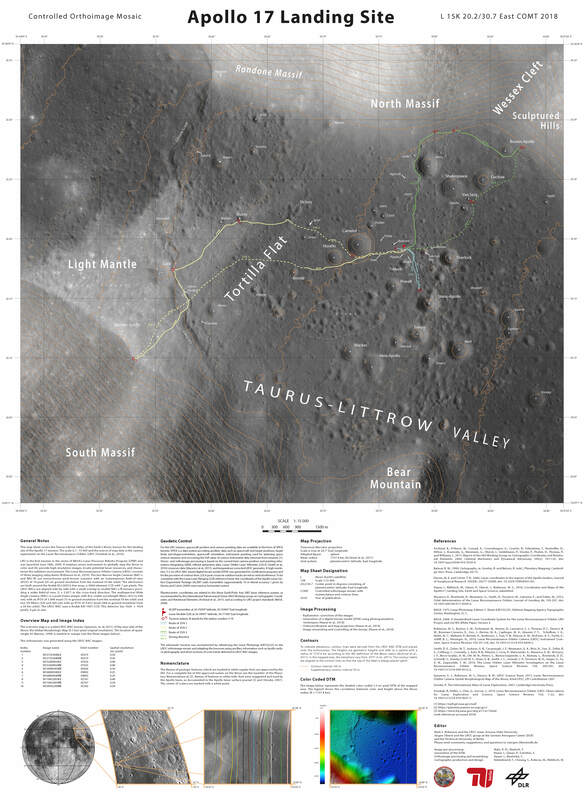 The route between stations were reconstructed by referencing and adopting the NASA Apollo 17 Traverse Map (NASA Edition1 Sheet 43D1S2(25)) to the LROC orthomosaic using ESRI ArcGIS. The traverse was slightly adjusted in some places where rover tracks could be seen in the orthomosaic, and where we found that determined camera stations deviated from the mapped route. Shapefiles of the mapped traverse and station coordinates are provided as ancillary products to the Apollo 17 orthomosaic which is provided as related product. The shapefiles should be viewed and used in conjunction with the orthomosaic or the 0.25m/pixel orthoimage to ensure the same georeference.